What does an addictive sewer and quilter do when they can't get to the sewing room, nor push the foot controller? Anything to feed the sewing obsession! After a little bit of foot surgery, I certainly couldn't get to the sewing room (down some stairs) nor push the foot controller even if I could. I had my hand crank ready to go, and tons of fabric scraps handy. Nothing fancy, just strips of various colored fabrics. Now I am wondering how I accumulated SO MANY strips of almost the perfect size! Must be left over from making the binding for previous quilts. Had some for so long, it was like meeting old friends again. After several weeks, I think I can get to the sewing room today! 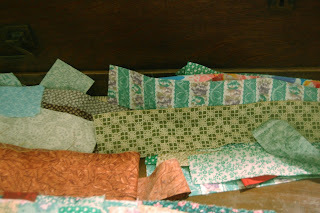 I will continue to "crank out" my scrappy quilt though while vising with relatives and friends upstairs. That is the beauty of the hand crank! It can go where ever I want to sew. 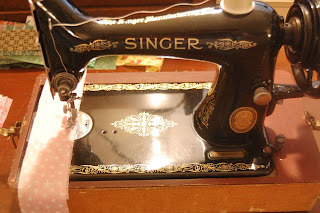 Just as an FYI, the Singer 99K was not originally a hand crank sewing machine. With much encouragement from fellow sewers, we took the motor off and added the crank. Works great and it is such a lovely machine to use. Any, and all, of my low shank sewing machine attachments will fit on this beauty. Try ruffling while cranking - talk about fun! You actually have quite a lot of control with your sewing, as the hand crank lets you sew very, very slowly or as fast as your little arm will move! 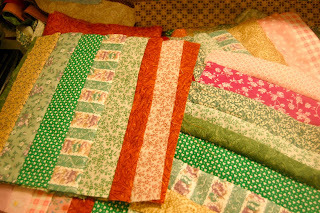 Will share the finished quilt later, right now back to the crank! Then off to the sewing room to revisit my machine and fabric stash! Hey Charlene...guess that is where my motor came from? I love 99's for all the reasons you list. No fw for me!! Hi there Lisa! That may very well be the one! It was running very strongly, but I just had to to the "motorectomy" job. Best way to get a hand crank at a nice price. Some day maybe will get an original. I use my mom's 99K in the sewing room (along with 3 or 4 others set up and ready to sew). 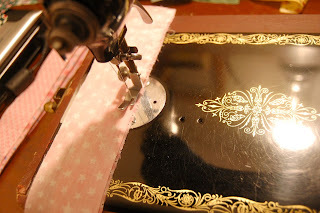 They are VERY strong working machines and the stitch is always gorgeous. Very much on the mend - thank you! Still hobbling and not in that sewing room yet but almost done with the hand crank quilt. Aren't all of us sewers just crazed to sew!? We can always find a way.